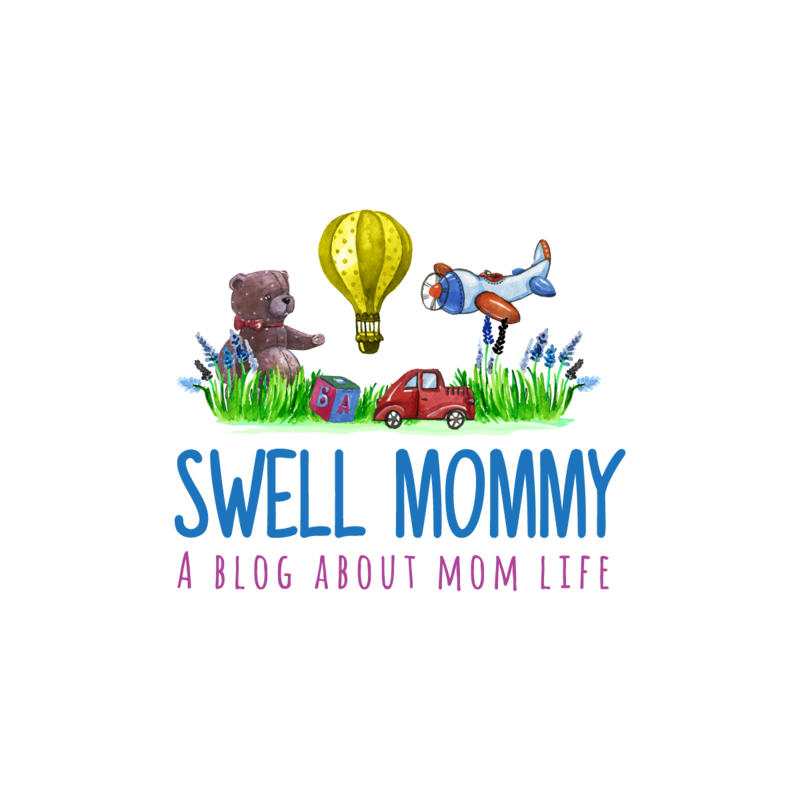 Swell Mommy: 6 Activities to Learn About Ladybugs! At BB's Montessori preschool, there is a theme for every week. Parents receive an email with homework that details what the kids are learning about so it can be reinforced at home. 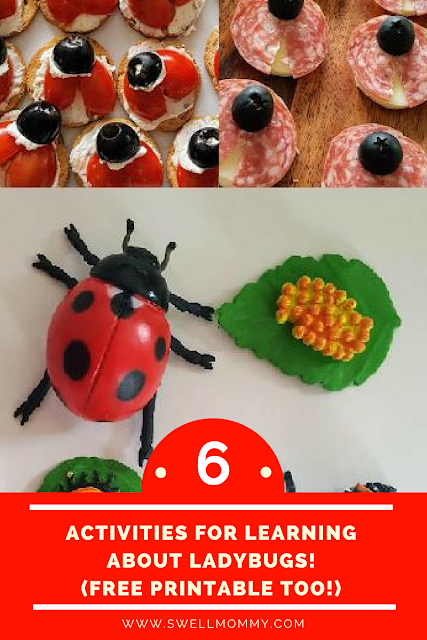 Recently, we had a blast doing ladybug based activities at home! 1. Video Research: We started by looking up a time lapse of the life cycle of a lady bug. 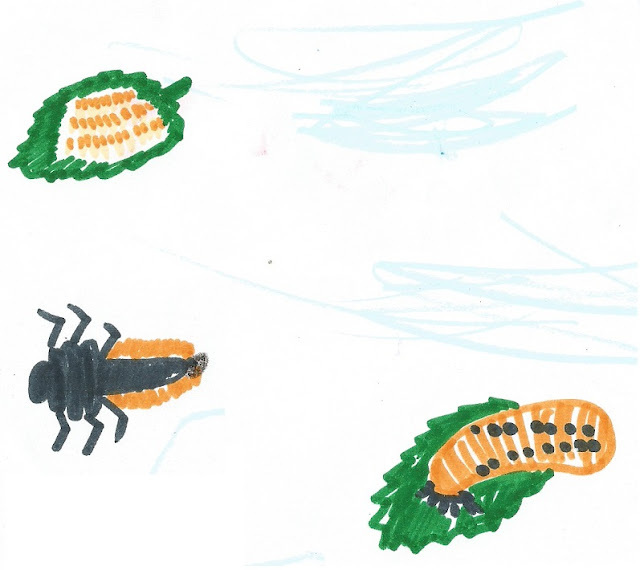 You know, for those of us who may not remember how an egg turns into a larva into a pupa and then into a beetle. This video is the best one I found on Youtube. There is something really mesmerizing about these little guys/gals. 2. Layout the Lifecycle. Using Insect Lore Ladybug Life Cycle Stages , I asked BB to show me what order the phases went. The school had sent a cutout worksheet that allowed the kids to do the same without needing to buy the toys. Surprisingly, BB got the order and the names right very quickly! I think it's his love of what he calls "beetle bugs." These were a hit with preschool aged BB and 1 year old ET. 3. Draw the Stages. There's nothing like art to solidify a lesson. The art supplies came out and BB and I spent some time drawing the ladybug lifestyle toys. Right now it's more about identifying colors and fostering a love of art and creating. BB likes to draw his then draw on mine. Can you tell who drew what? 4. Ladybug Snacks. There's a field down the street from us and we invited a family whose kids go to school with BB to come over for a playdate and hunt ladybugs. No playdate is complete without snacks so I made the following treats (some were even gluten free). Yes, I am aware they are not accurate representations of the insect with 3 body segments, 2 antenna and 6 legs. - Spread whipped cream cheese on melba toast. - Slice cherry tomatoes in half. - Slice a small sliver off opposing sides of each tomato to make wings. - Arrange sliced tomatoes on cream cheese in the shape of a ladybug. - Slice olives in half. - Spread a small amount of cream cheese on the cut side of the olives. - Place the cut side with cream cheese down on the tomatoes. - Serve the little lady bugs. - Place individual slices of provolone on the plate. 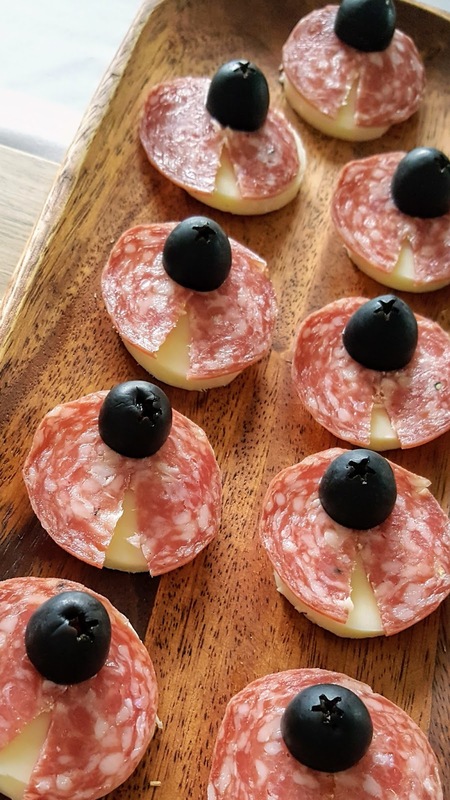 - Slice a tiny triangle out of each salami round. Multiple rounds can be stacked and cut at the same time. 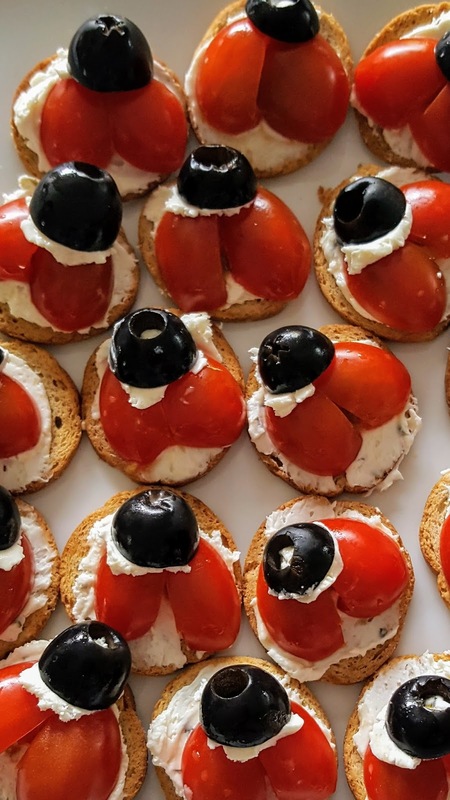 - Slice olives in half and place on top of the salami to make a head for the ladybug. 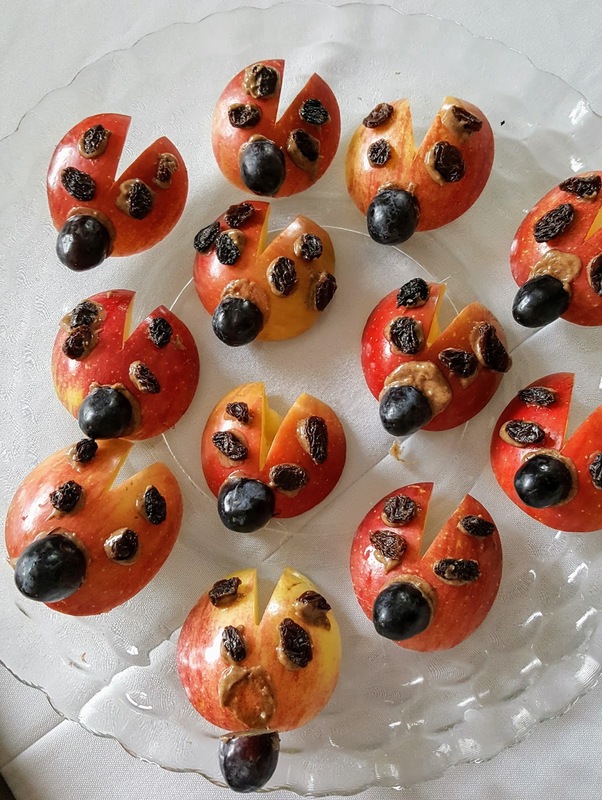 - Serve these gluten free little ladybugs! - Slice rounds off apples. I was able to get about 3 per apple. - Cut a triangle out of each round to form wings. - Slice grapes in half. - Spread apple butter on the cut side of the grape and place at the top of the triangle cutout. - Dip raisins in almond butter and attach to the apples on the wings. 5. Ladybug Hunting. The aforementioned field was lousy with ladybugs when we went ladybug hunting the day before playdate but I forgot to bring a container to bring the ladybugs home in. When we went for the playdate, we remembered a container for the ladybugs but there wasn't a ladybug to be found at first! Turns out it might have been the time of day. The best time to look for ladybugs is between May and October, depending on where you live. They can be found where there are lots of soft grass, fields or flowers. The secret for us was they were easier to find around the time the sun was setting because they only fly during the day and start to land and settle in for the night if they are migrating. Here is more information that is useful in the capture and care of ladybugs. If hunting doesn't work, many home improvement stores sell ladybugs for the garden as they eat garden pets like aphids. Try to pick ones that are already alive and not being stored in a cooler in "hibernation." That's just home improvement talk for "not alive" as we learned the hard way. 6. Counting Printable. 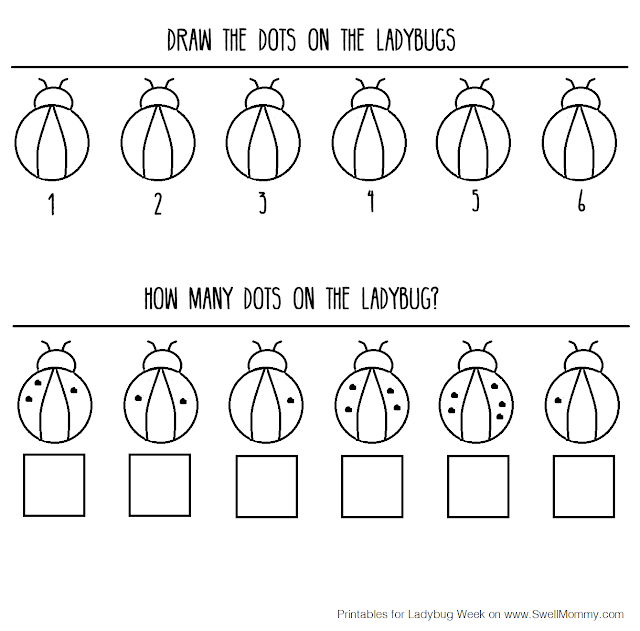 We're working on counting and coloring at the preschool age so I made up this nifty printable that BB and I worked on. He colored and drew dots corresponding to the number on the ladybug and I helped him write numbers. Check out the first printable I made! You can have it for free! 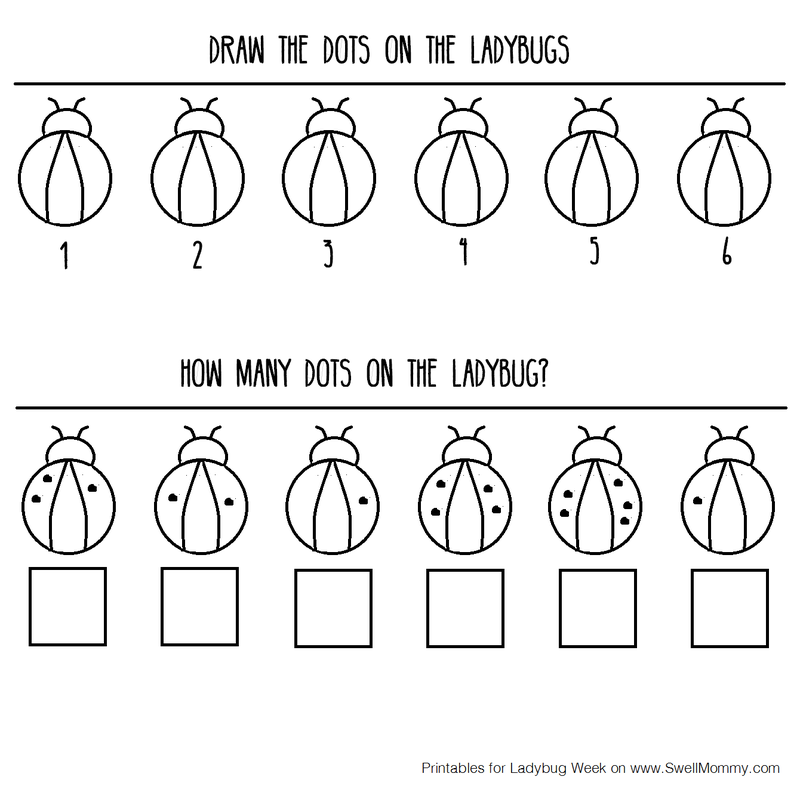 How did you like this ladybug activity guide? Is it something you'd like to see more of? 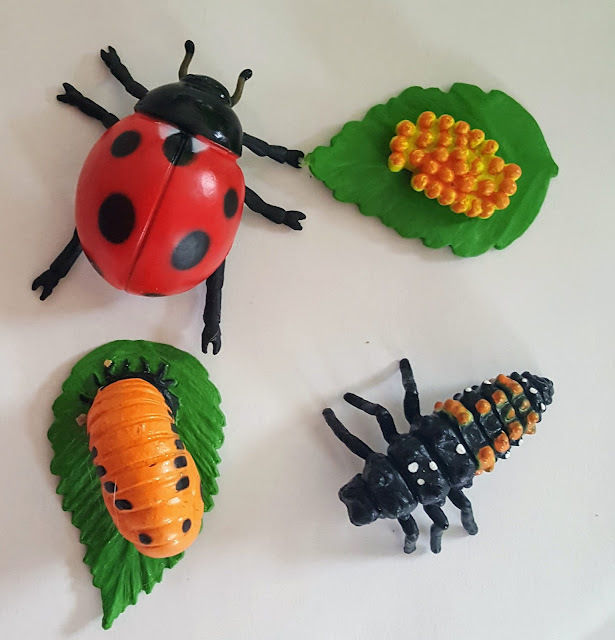 I am going to do the food ladybug experiment with my little one :) He's into bugs right now and he love tomatoes and cheese. His mind will be blown. I love this! I'm clueless and not creative so I never really know how to teach my kids things in a way they'd understand and retain. Thanks for sharing! Those ladybug snacks are presh!! My littles and I may have to make some of those this summer!